Meditation (Dhyäna) is the process of concentration of the mind on a single topic preventing it from wandering. We are always every moment in meditation; either virtuous or non-virtuous. This concentration could arise from intense passions like attachment, aversion, hatred, animosity, etc. This is not virtuous meditation. Since non_virtuous meditation is a cause of rebirth, it is worthy of rejection. On the other hand, if it arises from the search for the truth and from absolute detachment towards worldly affairs, it is virtuous meditation. If you observe the state of mind of the people, animal you will realize that most of them are always absorbed in the first two types of meditation (sorrowful and wrathful). Only few of them who are seeking liberation will be found in the righteous and pure meditation. The thought or activity caused by an outburst and intensity of sorrow is sorrowful meditation. In other words to desire for worldly pleasures, desire to get rid of sorrow or to get rid of disease is sorrowful meditation. The result of this type meditation is birth as animal, insect or plant. The meditation involving inclement thoughts is called inclement or wrathful meditation. In other words, one becomes happy by performing sinful acts like killing or desire to kill animal, insect, human etc is Wrathful Meditation. The result of this type of meditation is birth in hell. Sorrowful and wrathful meditations hinder spiritual uplift. They obscure the attributes of soul. They cause the natural disposition of self to disappear and initiate corrupt dispositions. Both these meditations are inauspicious and lead to an undesirable destination by accumulating more Karma. They are not related to spiritual advancement in any manner. In this kind of meditation an aspirant meditates on teachings of Tirthankars, chanting mantra, meditates on the 12 Bhavanas (reflections) and asking for forgiveness for our bad deeds. Also the aspirant reflects on the 9 Tattva of the universe in this kind of meditation. The self should think that he/she is simply a light which has no foe or friend. Thereby he/she should leave all desire for beauty, age, strength, wealth etc. It is contemplation about reality as described in the scriptures. Äjnä means whatever an all-knowing omniscient has said about religious truth is correct and true. One should not raise any doubts about them. Instead, one should think that it is possible that because of degrading time, the absence of an omniscient person, low caliber of my intellect, or any such reasons, I cannot comprehend the said religious truth but it is the truth. Omniscient Bhagawän has no reason to tell anything untrue. To think this way is called doctrine oriented righteous meditation (Äjnä Vichaya Dharma Dhyäna). To think of the nature of unhappiness and misery as generated by defilements like attachment,, hate, strong desire for worldly pleasure and then to think about how to get rid of the defilements, is called universal suffering oriented righteous meditation (Apäya Vichaya Dharma Dhyäna). To think that whatever pain or misery I suffer at every moment, wherever I move in the cycle of birth and death in worldly life, whatever ignorance I suffer are the results of my own deeds (Karma). I must practice equanimity during the fruition of different kinds of Karma so that new karma are not acquired. I must perform austerities to get rid of the existing Karma. This is karmic fruition oriented righteous meditation (Vipäk Vichaya Dharma Dhyäna). It is contemplation about the nature and structure of the universe. There are three world in the universe. They are the upper world, middle world (consist of billions of galaxies or dweeps) and lower world. These three worlds are filled with living (Jiva) and non_living (Ajiva) elements. The trans-migratory soul has gone through all these three worlds since beginningless time. As a result of the fruits of one’s own past deeds, the soul has been going through the infinite cycle of birth and death. This has happened due to ignorance, false beliefs, and not understanding the truth and reality. To think this way is called universe oriented righteous meditation (Samsthäna Vichaya Dharma Dhyäna). The concentration achieved by an immaculate mind is the spiritual meditation. Spiritual meditation occurs to very highly progressed spiritual souls. It occurs at the 11th, 12th, 13th and 14th stages of spiritual progress (11, 12, 13, and 14 Gunasthänas). The highly spiritual soul has either suppressed or removed all deluding karma. This meditation is of four types as mentioned below. It consists of four states: Multi aspect (Pruthaktva_vitarka), single aspect (Ekatva_vitarka), subtle activity (Sukshma_kriyä Apratipäti) and absorption in self (Vyuparat_kriyä Anivritti). Vitarka means scriptural text or Sutra. A person who is in 11th and 12th Gunasthäna and is versed in the Purva texts performs the first two Shukla Dhyäna. There are exceptions possible like Mäsatusa and Marudevi, even though not versed in the Purva, can engage in Shukla Dhyäna. Only Kevali (13th or 14th Gunasthäna) can engage in the last two subtypes of Shukla Dhyäna. It is performed by an aspirant with scriptural knowledge. Here the aspirant is attempting to attain the spiritual stages of subsidence or destruction of the conduct deluding Karma. The aspirant concentrates upon the three modes - origination, cessations, and continuity- of a particular substance (one of Shad Dravya). This type of meditation involves shifting of attention between the meaning, word and activity of the aspects of the substance. Hence, it is called multi aspect meditation with shifting. This meditation suppresses or eliminates conduct - deluding Karma (Chäritra Mohaniya). It is contemplation on a single aspect of reality on the basis of scriptural knowledge by an aspirant who is in the delusion free (Kshina_moha) spiritual stage. The aspirant concentrates on one particular form, word, or activity of the aspect of a substance without shifting. Such meditation is the single aspect stage of spiritual meditation. Thismeditation eliminates the four destructive (Ghäti) karma, namely perception obscuring, knowledge obscuring, deluding and obstructing Karma. Thus, it leads to omniscience. It is performed by an omniscient who has eliminated the gross activities of body, speech and mind, and has only subtle activities. Here the association of soul with body causes only subtle movements of the space_points of the soul. Hence, it is called the subtle activity stage of spiritual meditation. It is performed by an omniscient that eliminates even the slightest activity of the soul in spite of its association with the body. All activities (of the space points of the soul) cease in this meditation. Thus the influx of even the pleasant feeling pertaining (Shätä Vedaniya) Karma is stopped. Finally, all karma are shed and the soul attains salvation. At the end of this meditation, the soul obtains nirvana. The Soul becomes free of all karma, reaches the permanent adobe of Siddha (Siddha Loka) and resides in pure happiness forever. According to Jain Scriptures, Shukla Dhyäna is not possible here on this planet at present time. Some misinterpret Shukla Dhyäna as a meditation of bright white color. However, here Shukla does not mean white but pure and it involves the meditation of the self (soul). Maximum time, one can be in meditation is less than 48 minutes. permanent happiness in a pure state forever. One should not be misled that physical exercises, Äsana and similar health improving activities, are Dharma Dhyäna. However, good health for good spiritual practice is desirable. 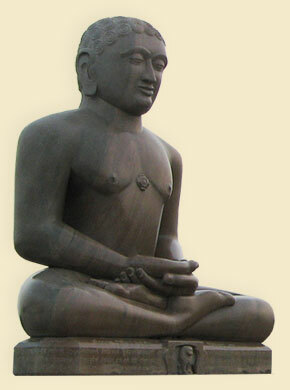 Dharma Dhyäna is essentially a spiritual contemplation. Kayotsarg means abandonment of body with self-awareness. Body and soul cannot be experienced at the same time. To experience the soul and stop experiencing the body is Kayotsarg. In Kayotsarg the aspirant stops all activities of mind, speech and body. This type of meditation can be done in any posture. It can be done in standing, sitting and sleeping posture. In Kayotsarg, the aspirant feels death-like experience and also imagines, “I am not this body, I am soul” by minimizing the activities of 1) The muscles, 2) Vital flow of energy and 3) Brain activities. During Kayotsarg the body is brought into a motionless posture. Starting with the big toe of the right foot up to the highest point of the head and led into unimportance= a death-like state. This meditation like state is one part of the religious activities of followers of Jainism. During Kayotsarg, an aspirant takes vow to remain in a motion-less posture for finite time period like 48 minutes etc. Kayotsarg is a very useful meditation technique to realize the real self, the soul. The objective of Kayotsarg is purification of soul. A Jain monk or a householder does retrospection. Kayotsarg forms a part of retrospection. An aspirant accepts Kayotsarg with the following resolution. “I practice Kayotsarg in order to destroy the sinful karma through annulment of past negligence, through penance, purification and freedom from pain”. When the activities of mind, body and speech are stopped in Kayotsarg, the soul starts to get free from much karma accumulated in the past. 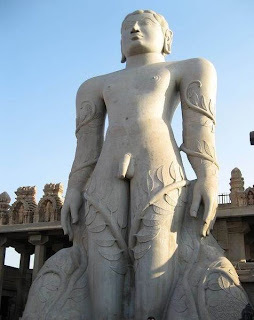 Bahubali, the son of Lord Rishabhdev stood in Kayotsarg for 12 months without any movement of mind, speech and body. Lord Rishabhdev also remained engrossed in Kayotsarg for 6 months. A question arose as to how long could one practice Kayotsarg? In the scriptures, it is mentioned that the maximum time for one to stay in Kayotsarg is 60,000 years!! It’s not possible for one to do so in the present time period as the life-span of individual has decreased. But one should practice Kayotsarg everyday for at least an hour to destroy previously accumulated karmas. I can’t wait one month to read your blog. Is there any way you can write every 15 days. It is very informative. I need help from you or some one with right knowledge. I am in USA (New Jersey) born as a jain but until now I was jain by cast only and not by deeds. I am reading lot of history etc for Jainism. But can you put some practical acts (considering we live in real world with real family and other responsibilities) which can help people like me to reduce bad karma and slowly march towards haven. I know it’s very difficult to ask but I am looking for practical methods which I can adopt in my day to day life. And yes i would like to know how many types of kayotsarg is there in jainism and and whts the duration. kayotsarg means total relaxation by experiencing that body and soul are separate. This can be practiced by standing or lying posture. The body should be still. In kayotsarg one tries to giving up physical consciousness and becomes absorbed in spiritual consciousness. In order to develop higher absorption in the self one also requires the higher control over senses, passions, attachment and aversion. This happens in the higher stages of spiritual developments (Gunasthan). By remaining in the spiritual consciousness and practicing bhed gyaan one becomes able to shed his/her passions and becomes free from attachment and aversion. Thus the delusion karma sheds away and the remaining four destructive karma also sheds away and thus he/she attains Omniscience (keval gyaan). Thus Kayotsarg is the highest austerity. Kayotsarg is the part of the austerity called "Vyutsarg". Vyutsarg is the 12th and the last austerity of Nirjara tattva. • Abandonment of external aspects is called Dravya Vyutsarga. • Abandonment of internal aspects is called Bhäva Vyutsarga. One has to have Bhed Jnän (Vivek Jnän; discriminatory knowledge that the soul and the body are separate) to be able to exercise Vyutsarga. Samvar is the process of stopping the influx of Karma and Nirjarä is the process of purifying the soul by eradicating the Karma. These two processes liberate the soul from the cycle of birth and death and thus Moksha is achieved. Therefore, Samvar and Nirjarä constitute the pillars of religion.